Roman Emperors were rulers of the Roman Empire, wielding power over its citizens and military. The empire was developed as the Roman Republic invaded and occupied most of Europe and portions of northern Africa and western Asia. Under the republic, regions of the empire were ruled by provincial governors answerable to and authorised by the "Senate and People of Rome". Rome and its senate were ruled by a variety of magistrates – of whom the consuls were the most powerful. The republic ended, and the emperors were created, when these magistrates became legally and practically subservient to one citizen with power over all other magistrates. 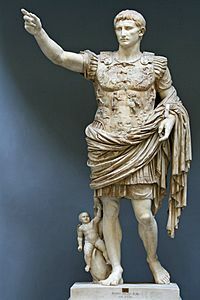 Augustus, the first emperor, was careful to maintain the facade of republican rule, taking no specific title for his position and calling the concentration of magisterial power Princeps Senatus (the first man of the senate). This style of government lasted for 300 years, and is thus called the Principate era. In the late 3rd century, after the Crisis of the Third Century, Diocletian formalised and embellished the recent manner of imperial rule, establishing the so-called 'Dominate' period of the Roman Empire. This was characterised by the explicit increase of authority in the person of the Emperor, and the use of the style 'Dominus Noster' ('Our Lord'). The rise of powerful Barbarian tribes along the borders of the empire and the challenge they posed to defense of far-flung borders and unstable imperial succession led Diocletian to experiment with sharing imperial titles and responsibilities among several individuals - a partial reversion to pre-Augustian Roman traditions. For nearly two centuries thereafter there was often more than one emperor at a time, frequently dividing the administration of the vast territories between them. ROMVLVS AVGVSTVS c. 460 AD, ? Appointed by his father, Orestes. Not recognized by the Eastern Empire. October 31, 475 AD – September 4, 476 AD (in Italy) Unknown. 13/14 November 565 Born in 482/483 at Tauresium (Taor), Dardania. Nephew of Justin I, possibly raised to co-emperor on 1 April 527. Succeeded on Justin I's death. Retained power despite the Nika Riots of 532. Justinian's supreme general, Belisarius, reconquered much of Eastern and Central Europe from the Ostrogoths. Contracted the Bubonic Plague and fell into a coma. Empress Theodora acted as regent during Justinian's coma. 23 September 867 Born on 19 January 840, he succeeded on Theophilos' death. Under the regency of his mother Theodora until 856, and under the effective control of his uncle Bardas in 862–866. Ended iconoclasm. Murdered by Basil the Macedonian. 15 March 963 The only surviving son of Constantine VII, he was born on 15 March 938 and succeeded his father on the latter's death. He ruled until his own death, although the government was led mostly by Joseph Bringas. His reign was marked by successful warfare in the East against Sayf al-Dawla and the recovery of Crete by general Nikephoros Phokas. 10 December 1041 Born in 1010, he became a lover of Zoe even while Romanos III was alive, and succeeded him upon his death as her husband and emperor. Aided by his older brother, John the Orphanotrophos, his reign was moderately successful against internal rebellions, but his attempt to recover Sicily failed. He died after a long illness. 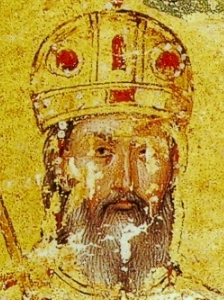 20 April 1042 Born in 1015, he was the nephew and adopted son of Michael IV. During his reign he tried to sideline Zoe, but a popular revolt forced him to restore her as empress on 19 April 1042, along with her sister Theodora. He was deposed the next day, dying on 24 August 1042. List of Roman emperors Facts for Kids. Kiddle Encyclopedia.